A man who caused the death of his friend in a car crash has been jailed for four years and eight months. Syed Hassan, 22, from Bristol, was a passenger in Muhammad Awaisi's Audi Q7, which hit a wall in Bowling Back Lane, Bradford, West Yorkshire, in January 2018. He died at the scene. 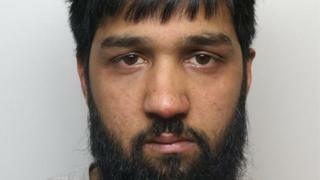 Awaisi, 23, also from Bristol, pleaded guilty to causing death by dangerous driving at Bradford Crown Court. He was also disqualified from driving for nearly six years. The court heard that Awaisi's vehicle was seen moments before the crash travelling at almost 60 mph - nearly twice the speed limit. His driving was made even more dangerous by bad weather conditions at the time, police said. The court heard Mr Hassan was not wearing a seat belt and died almost instantly from "catastrophic head injuries" sustained in the crash. Mr Hassan and Awaisi had been close friends since school and Mr Hassan was due to be best man at Awaisi's wedding. In the aftermath of the crash, Awaisi initially claimed that Mr Hassan had been driving the Audi and also tried to blame him for forging an insurance certificate which had enabled the defendant to borrow the high-performance car for the weekend. Det Con Simon Marshall of West Yorkshire Police said: "The fatal collision on Bowling Back Lane was an absolute tragedy for Syed's family. That day they lost a bright, intelligent man, whom was loved dearly by so many. "Throughout the investigation [Awaisi] sought to evade justice and only at the last moment admitted the offences against him. "Speeding in such bad weather conditions was an act of utter stupidity and extreme recklessness which frankly beggars belief."